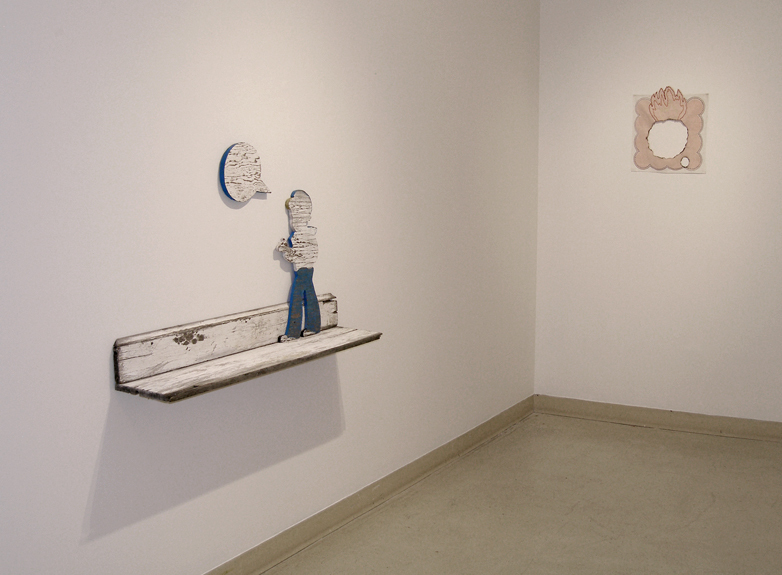 In this incarnation, the Paper Machete concept was adapted to suit the needs of its host institution, Gallery Lambton. 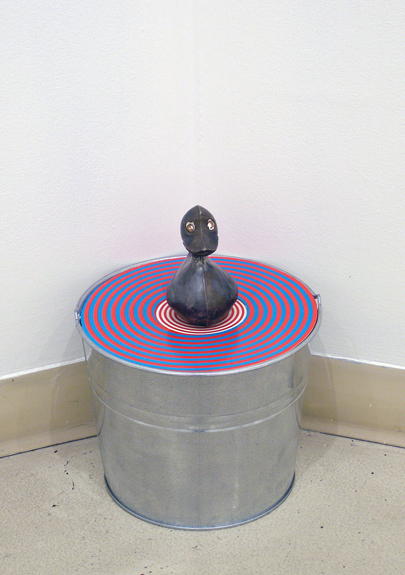 While many of the circumstances that have come to define the project remained intact — the ideas that artwork would be created socially within a gallery-turned-laboratory environment, over a specified period of time, using mainly found materials gathered from the host region at the start of the project — the practice of importing in a team of CAROUSEL-sanctioned artists sharing a common aesthetic was stripped away in favour of a more community-specific approach. The Sarnia project instead positioned Mark Laliberte in an artist-in-residence role, acting as both participant and mentor/guide to a team exclusively comprised of local artists. Norm Barney, Jessica Butler, Hailey McHarg and Melissa Upfold were injected into a chaotic collaborative scenario at Gallery Lambton for an entire week, with the expectation that they were to play integral roles in the creation of a public exhibition. This basic shift did not compromise the tenets that the series concept was built on; rather, it simply added a new, angular dimension to fit into the mix. Each time a Paper Machete event is hosted, it seems inevitable and conceptually acceptable that some of the guiding principles will mutate; it is a kind of idea-environment that works best when allowed to bend to fit its newest context. Indeed, in this version of the game, the advanced defining of players was not the only element destined to shift. In the end, paper itself did not surface as a material focus, with members avoiding two-dimensional collage altogether, instead preferring a more physical approach to examining form and space. This had a lot to do with the kinds of materials we collected together on the first day of the residency, during an overwhelming trip to a massive candy land warehouse of junk in Petrolia, located just outside of Sarnia's city core. This starting point ended up offering us a very inspiring archive of source materials that guided our hands almost entirely towards the tactile third dimension. 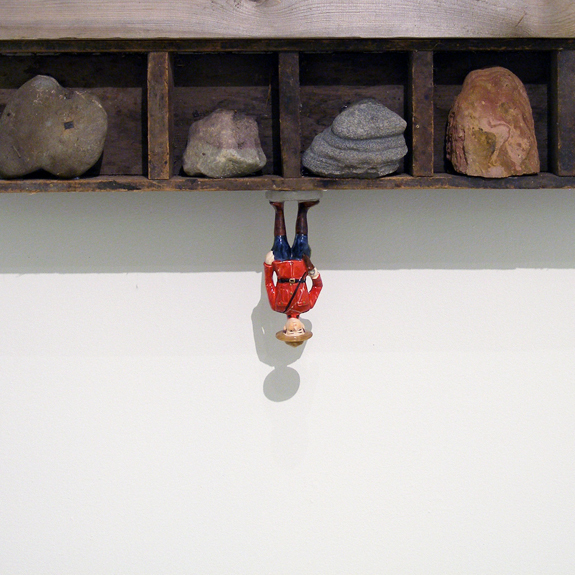 Throughout the residency, our heroic participants were encouraged to drop their guard and allow intuition to motivate their actions and frame their creative gestures. Most importantly, it was essential that each participant add their own unique visual layer to the overall mix of things. The group spent five frenzied days together collectively transforming blank walls. 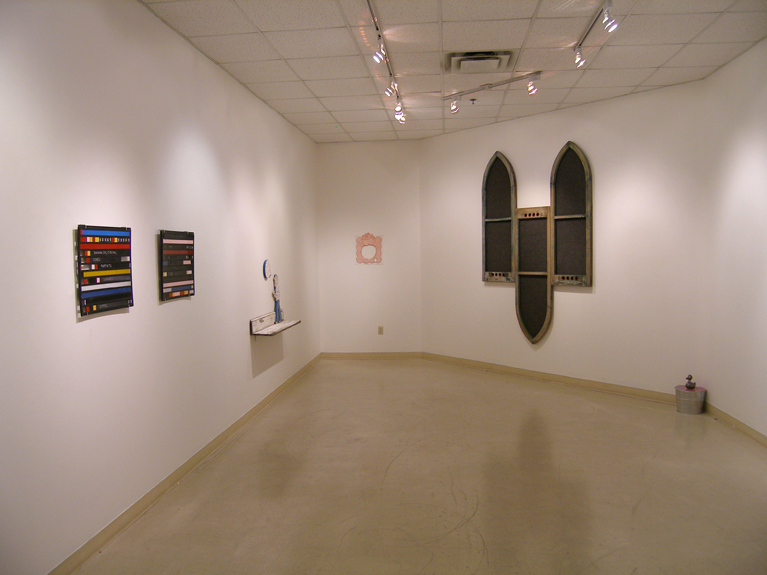 The finalized exhibition featured a dozen or so singular works presented in the Sadie Knowles gallery space, as well as a few dense, playfully constructed art environments fitted into other, alternate display spaces generously afforded us by the Lambton administration. Gallery Lambton is one of a handful of contemporary exhibition spaces currently opening up to the idea of providing opportunities for artists to experiment with one another in real time and "in-the-field". By blending the philosophy of a residency with the framework of a public exhibition, the Paper Machete project offers an opportunity for artists to run wild through the streets, in the name of art, like creative wolf packs. It provides a context for a group of creative thinkers to den up together in a white box, to hunt and gather in unfamiliar territory, and to challenge individual process through collective experimentation. 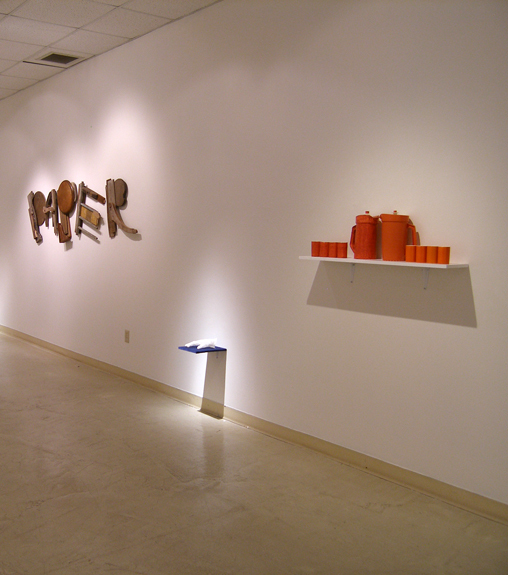 By allowing for the free-form use of a gallery environment for a specific period of time, the host institution is thus facilitating a new kind of exhibition experience for both creators and their audiences, one that is simultaneously intuitive, playful, social and time-sensitive. The works displayed throughout this new exhibit are the result, first and foremost, of a special combination of advanced artistic play and creative struggle. They are unique to the moment, and some will likely never live on beyond this singular exhibit. But a few of these works will possibly transcend this specific context to be later expanded upon, improved and shown again and again, as each participant artist continues to dwell on the Paper Machete experience well beyond the confines of the residency timeline. Great artwork always lives on — in the mind, and with perseverance, out into the world.